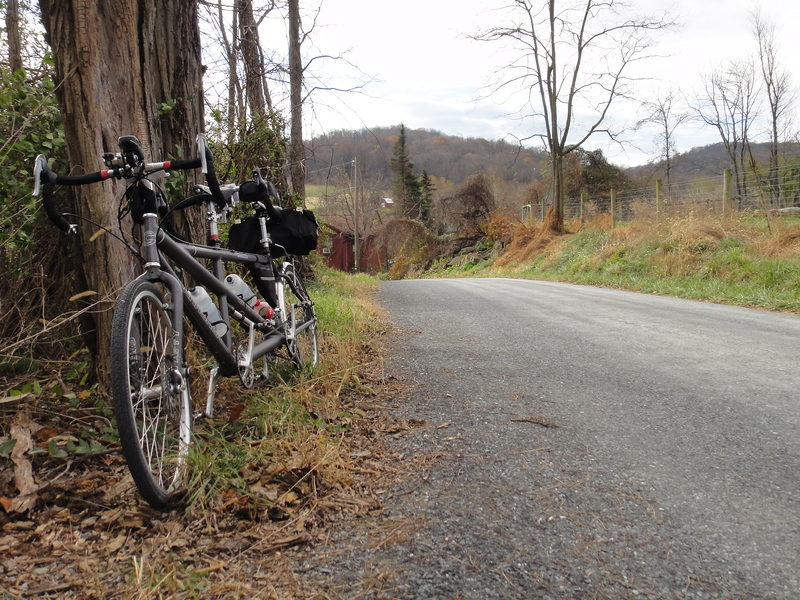 Every once in a while it seems like a good idea to test my tandem stoker climbing skills on an ultra-hilly bike ride. 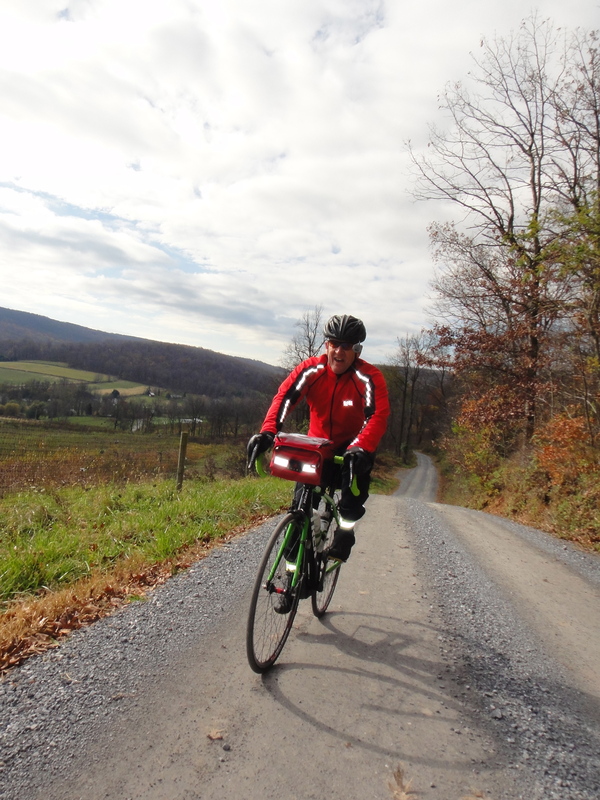 The opportunity to do just that came in the shape of the Grand Fondue, a combination of dirt and paved roads ride sponsored by the Bike Doctor of Frederick, Maryland. The full route came in at 99 miles and just over 11,000 feet of cumulative climbing, the gnarliest parts of which came in the first 60 miles of the ride. I should also add that these kinds of rides often are good ideas when I find myself sitting behind my desk dreaming about a weekend adventure. When I heard about the plan for the Grand Fondue, I immediately embraced its concept. 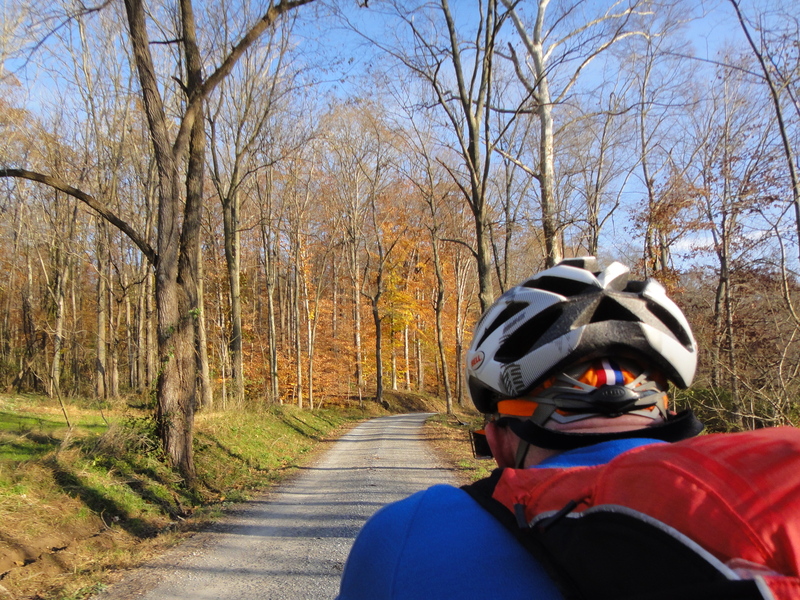 A ride about good roads, especially some unpaved ones. A big ride for a low cost, a mere $15 entry fee. An event with fondue and wine at the end! The additional challenge of attempting the Grand Fondue on tandem held its own appeal. I originally thought I would be unable to participate in the Grand Fondue, as it was planned for the same day as the Marine Corps Marathon. With the impending storm, however, Bike Doctor rescheduled the event to November 4 so, lucky me, I was able to have my cheese and it eat, too (or something like that). 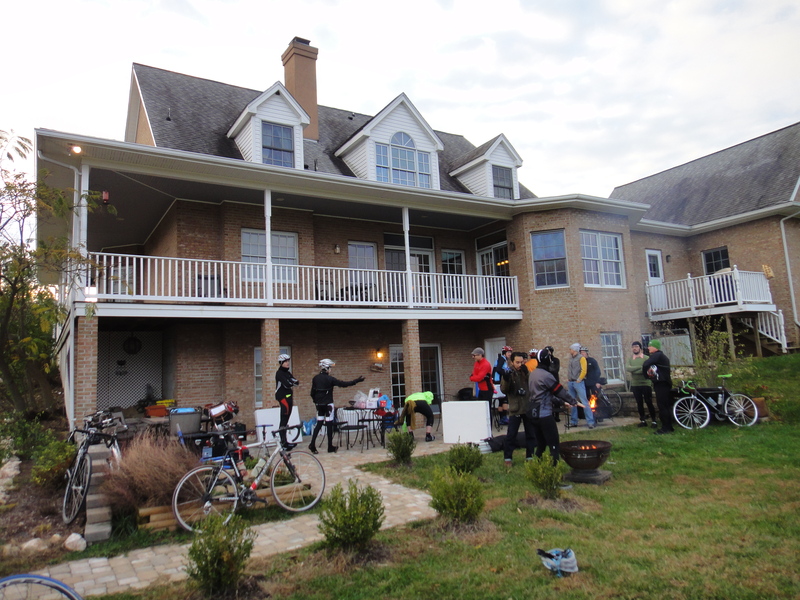 A fairly small group gathered at the ride start, the Orchid Cellar, just outside of Middletown, Maryland. I’d guess around 20 people were there, riding all sorts of interesting bikes. The bike selection was varied: Surly, Gunnar, Trek, Waterford, two hand-built J.D. Buchanans. Lots of steel, some carbon. Our Cannondale was the only tandem. The morning was cool, but not freezing, winds were light, and it felt like it was going to be a good day to ride. Riding buddies Barry B. and Dave S. were there, as was riding acquaintance Dan, who was riding his Trek 330 Elance. The group rolled unceremoniously out of the parking lot a few minutes after 7 a.m., and soon thereafter the fun began. The Grand Fondue Frederick is going to be a beautiful but hard ride. There will be gobs of climbing, dirt roads, and then more climbing. They were absolutely truthful about that, and Felkerino and I both said that this ride is one of the hilliest we’ve done in a while. My legs were feeling some residual fatigue from the previous week’s marathon so, while I went into the ride hoping to complete the full 99 miles, my primary aim was to explore some new roads, enjoy the experience, maybe meet some new people, and not suffer. Or at least, not suffer too much, as a ride like this invites its share of seriously uncomfortable moments. 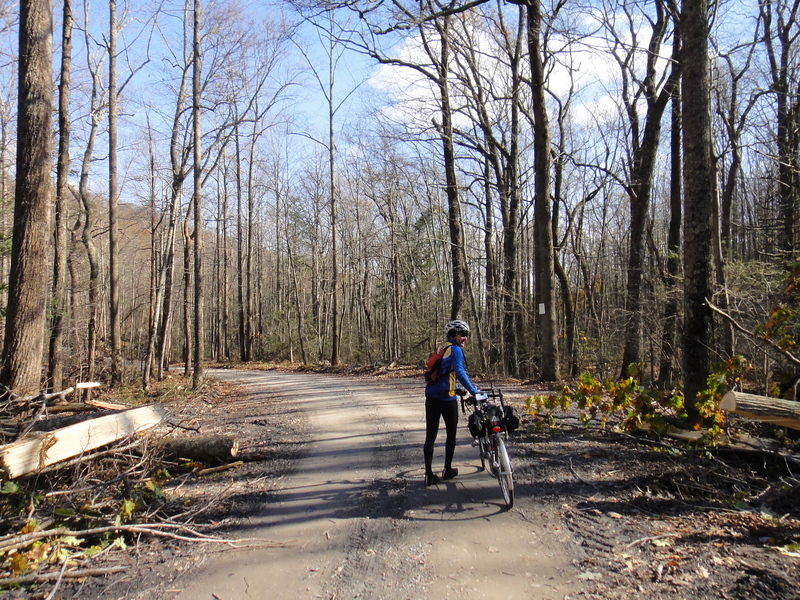 This route did not have many recovery sections, which we knew would be the case. Either we were climbing our way up or bombing down a descent that leveled off momentarily only to go up again. Almost all of the climbs rewarded with beautiful views, although a couple of the descents were fairly rocky and bumpy, which meant exercising restraint on the downhills. Not all of them, though. The first major downhill of the day, off of Frostown Road, offered a clear runout on smooth pavement and Felkerino and I hit 55 miles per hour going down it. That felt pretty awesome. I am proud to report that Felkerino and I did not walk any of the climbs, despite their ridiculous grades. Oh, and I’m also relieved to report that we did not fall over. That would have been embarrassing. I don’t know why I’m proud that we didn’t walk, exactly, as I believe there is no shame in doing so. I think it’s mostly because, as we ground away in the granny at three-and-a-half miles per hour while my quadriceps shouted mean things in my direction, the urge to stop pedaling was strong. The ride began amid cloud cover, but as the morning wore on the clouds moved out and blue sky and sun poked through to hang out with us. The sun made a world of difference to my demeanor. In addition to making the temperatures that much more pleasant, the light it cast over the trees and landscape brought warmth to all of the lingering fall color. Rides with this kind of up-and-down profile can make it difficult to ride with others, especially for a tandem. As a tandem team, we climb slower than most singles, but descents are our specialty! We rode the first half of the ride with our friend Barry until we lost him after a descent. We had decided to wait for him at the bottom of a hill to make sure he made it down ok, but then we realized that we had missed our turn and were waiting for him off course. GRR! After that, we rode on our own except for one mile where we crossed paths with Mark, another Grand Fondue rider. We also intersected briefly with a group that was doing a 35-mile version of the Grand Fondue. 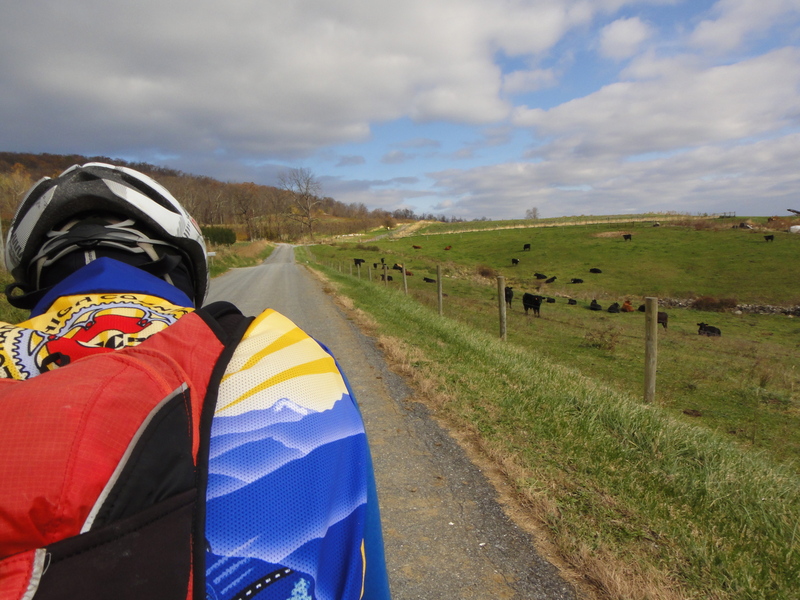 Because the ride was basically a bunch of loops around Middletown, Maryland, it was rife with shortcut opportunities. Felkerino and I followed the route until the daylight started to wane and at mile 80, we made the decision to head back. 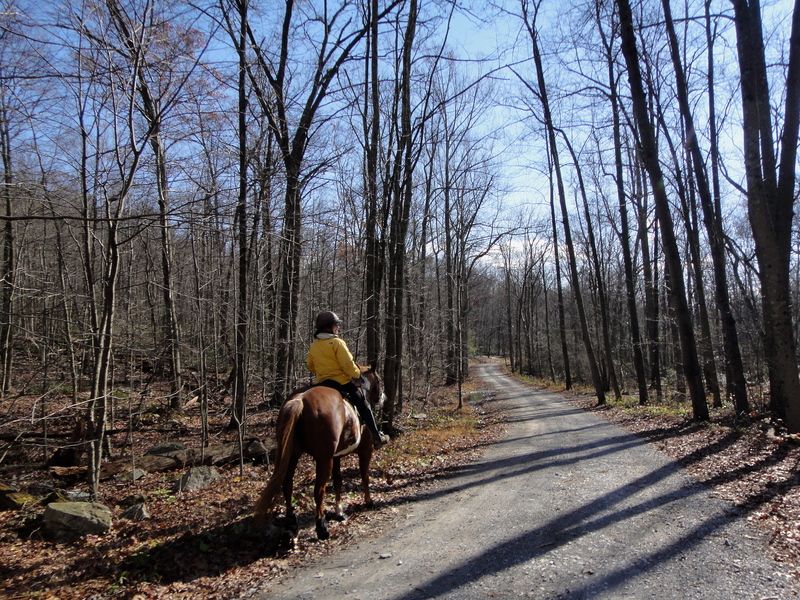 We had no interest in riding after dark; the temperature would drop, we wouldn’t be able to appreciate the scenery, and we just didn’t feel like it. We made the most of the day and enjoyed most of the climbs (Teen Barnes Road I could really have done without) and all of the vistas. We also took breaks to eat, rest, and even take pictures as we went along. We arrived back at the ride start just as the sun made its final exit for the day, ending up with 86 miles for our efforts and over 8,600 feet of climb for the day. I’m good with that. Dave S. completed the 68-mile version. Barry, on the other hand, completed the full 99-mile shebang. Go Barry! The Bike Doctor put together a superbly challenging route over low-traffic roads with gorgeous vistas. I hope that Bike Doctor plans to do this event again, but perhaps in the early fall. While I loved doing it on Sunday, this ride is better suited to longer days in warmer temperatures. 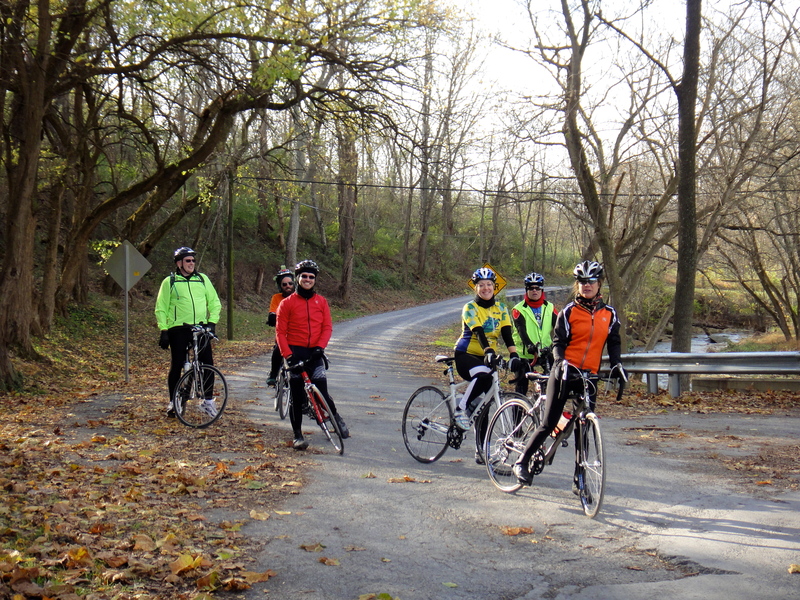 Hilly rides in cool weather get tricky because you usually have to carry more layers. You also sweat up on the uphills, and after getting all damp from climbing, descents can be pretty chilly. Felkerino and I took an hour and 45 minutes off the bike throughout the day. We could certainly have been more disciplined in our ride approach. However, we wanted to have a sit-down meal given all the effort we were putting into the ride, and we also stopped more than a few times to allow our legs to recover and to take in the beauty of the day. If the ride had been earlier in the year, we would not have had to worry about the dark monster as much and could still have taken a more leisurely approach to the event. This horse and rider were not on the Grand Fondue, but it was fun to see them. I have more photos from the ride, and you can find them here. Felkerino took pics, too. Note that all the ones Felkerino took of me show my progressive descent into madness due to intense climbing. I felt lucky to have been able to participate in the Grand Fondue. I experienced beautiful roads and vistas, met a few new people, and remembered what it was like to do a ride that delivers more than 1,000 feet of climb for every ten miles. While I don’t see myself attacking this course again any time soon, it’s definitely a winner. I’ll be back to ride many of these roads, just maybe not all in the same ride. Thanks for the awesome write up. We originally thought of the Grand Fondue on a (who’d have guessed it) hilly gravel whatevering ride as a way to poke fun at the self importance and cost of the Frederick Gran Fondo ‘national championships’. That ride was mid october, and we needed to give people who were actually going to ride that a week or so recovery time, hence the late October date. We plan on doing it earlier next year, though. Also, this spring, we are going to try to do one out near Libertytown, where there is a plethora of dirt roads, and a few good wineries, so stay posted on that! Do you mind if we link to this blog? -James and the Bike Doctor Frederick Crew. Oh, that explains the scheduling. The spring ride sounds great! And please feel free to link to the blog. Thanks for the great ride! Lovely photos– but where’s the cheese? Loved the write-up! I also really liked your descriptions of the slow grinds in the granny gear. That’s my world! I also feel it a matter of pride if I don’t stop to walk on tough climbs. I do realize there is no shame it either, but I feel much better about the ride if I don’t have to do it. Last weekend I did my first real recovery ride. 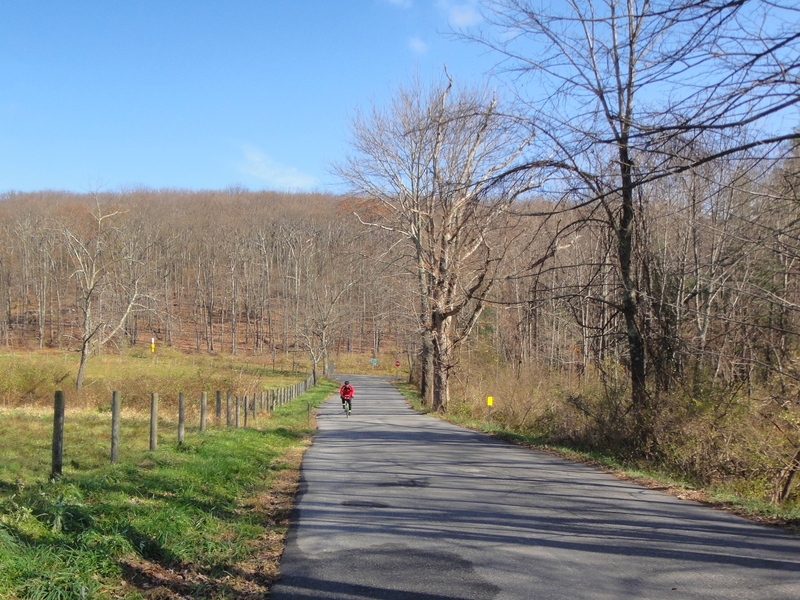 A 44-mile round-trip climb to Mt. Hamilton, which I believe is our highest mountain in the San Francisco Bay Area. It was pretty much climb all the way up to the top, then descent all the way back. I came close to walking a few times, which is why your post resonated so much with me. Again, thanks for the great tale of adventure! Looking forward to more. It looks like a beautiful route. Kudos to you for that epic ride a week after your marathon! That was some of the hardest climbing I can recall. Interesting to see your photos. I see you passed the horse lady and the woman at the pottery place. I passed both of them and asked if they had seen the tandem couple. Both said no, so I now know I was in front of you after the missed turn. Great write-up and riding. You guys are speed demons on the gravel road descents. Oh, and kudos to the Bike Doctor. Great event! Nice essay Mary. What a wallop of a ride that was! Three days later & my quads are still weeping. I bet it was a chore moving that tandem across some of those roads (read: Hayes & Fishing Creek). See you in Centreville.